If you told a NHS director of finance that they could reduce patient operating times and reduce the time that in-patients spend in hospitals, they’d most likely snap your hand off. This could soon become a reality with the introduction of hybrid operating theatres, which combine high end imaging equipment with a traditional surgery environment. However, there are several considerations that must be made to make the investment a success, as Steve Hughes, Managing Director of REO UK, explains. So, what are hybrid operating rooms? While they may sound like they come from a sci-fi novel, the operating rooms have been implemented in NHS hospitals across the UK, such as the St George’s University Hospitals Trust in London. Many NHS managers may soon be considering investing in them for their own hospitals. Hybrid operating rooms combine both the traditional operating theatre with high end imaging systems such as Magnetic Resonance Imaging (MRI), Computed Tomography (CT) scans or angiography systems. Previously, only mobile imaging equipment was based inside an operating room. However, the quality of the images created by this equipment was often not high enough to base surgical procedures on. For example, mobile angiography systems have a lower image quality due to lesser tube performance and a low refresh rate. This is problematic for endovascular cases where surgeons need to see the smallest blood vessels. In the past, the patient would have to be wheeled out of the sterile environment of the operating theatre and taken to the imaging department. However, in the hybrid operating theatre, the imaging system can be continually used to guide the surgeon. This follows the trend of Minimally Invasive Surgery (MIS) that REO UK recently identified in its state of medical technology report. This is where surgeons try to reduce the trauma involved in surgery by minimising the size and frequency of incisions. For example, surgeons can carry out vascular surgery for aortic aneurysms without the need for open chest or abdominal surgery. The reduced trauma helps to reduce the risk of complications, lowers patient recovery time and shortens the average length of hospital stays after the procedure. However, before hospital managers jump at the chance of this, they must consider the complications of bringing so many pieces of equipment together. “These are complex projects with high end equipment and interdisciplinary collaborations,” explained Jane Whittaker, Angiography Business Manager at Siemens Healthcare. An important point that all parties should consider is power quality and the problems that can occur with so many different electrical requirements in a single room. With imaging systems and traditional monitors in an operating room, design engineers must consider the additional power quality implications of this compared to a traditional operating room. For critical systems that are taking measurements or displaying essential images, any electrical interference in the mains supply could affect the performance of the equipment, putting patients at risk. When designing electrical equipment to go in hybrid operating rooms, engineers must therefore incorporate components to reduce the effect of electrical interference. An important way to do this is by using isolating transformers such as REO’s REOMED range. These products are specially engineered to go above and beyond the required medical standards such as the European EN60601-1 standard for electrical medical technology. When the transformers are used in operating theatres, they allow safe galvanic separation between the primary and secondary circuits. This limits interference from other devices in the operating theatre, as well as protecting equipment from poor power quality. Traditionally, some engineers are put off by electrical transformers for medical environments, as they tend to have quite high electrical losses. This reduces energy efficiency, which could negate the cost savings made by reducing patient costs with hybrid operating theatres. However, REO UK’s REOMED transformers have been shown to deliver a 45% reduction in electrical losses compared to conventional electrical transformers. 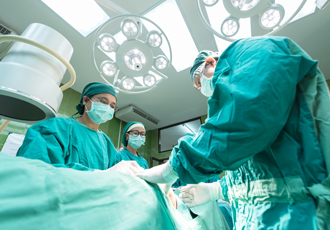 Therefore, to reap the benefits that hybrid operating theatres bring to hospitals and patient, it is vital that design engineers consider the implications for power quality in this new type of environment. If they fail to consider the need for isolating, engineers may negate the cost savings made by the hybrid theatres and decrease the quality of patient care, rather than increase it. This is only one instance of how design engineers can contribute towards improving power quality in healthcare settings.